Luis Ramos is Head of Communications for thyssenkrupp Elevator AG, and manages a global team handling corporate, marketing, and internal communications at a 50,000-employee firm. thyssenkrupp Elevator is a global leader in an industry that moves over 1 billion people each day, an industry instrumental in shaping cities as the best ever places to live. In the last two years, the company launched three game-changing products which are set to transform the way people move in buildings and cites and alter building design concepts as a whole: the ACCEL fast travellator; MULTI rope-less elevator; and MAX machine-learning cloud-based predictive service. 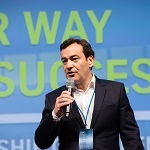 Prior to joining thyssenkrupp Elevator AG in early 2014, Luis spent twelve years as Director of Communications and Public Affairs for Bombardier Transportation across various regions, including Southern Europe, South America, and India, where he first began his deep involvement in industries which shapes cities. Luis has also worked at DaimlerChrysler Rail Systems as VP Marketing and Sales, Portugal, and has an academic background that includes mechanical engineering and several courses in marketing, communications and political marketing at institutions such as Lisbon University, Stern Business School (NYU), and Kellogg School of Management.